carries both MIDI and audio so you don't need to connect an additional USB cable for MIDI. Connect any standard momentary foot switch to trigger hands-free punch-ins during recording. Or map the foot switch to any keystrokes you wish in your host audio software. 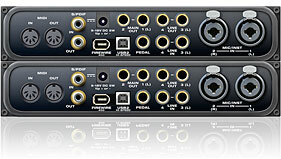 You can resolve the Audio Express directly to SMPTE time code, without a dedicated synchronizer, via any analog input. The Audio Express provides a DSP-driven phase-lock engine with sophisticated filtering that provides fast lockup times and sub-frame accuracy. This technology represents the very latest in extremely high-performance, yet cost-effective digital audio clocking. DDS also allows the Audio Express to maintain an extremely stable clock while resolved to incoming clock sources that have substantially more jitter than the Audio Express itself. The included MOTU SMPTE Console™ software (for Mac OS X and Windows) provides a complete set of tools to generate SMPTE for striping, regenerating or slaving other devices to the computer. Like CueMix FX, the synchronization features are cross-platform and compatible with all audio sequencer software that supports the ASIO2 sample-accurate sync protocol. 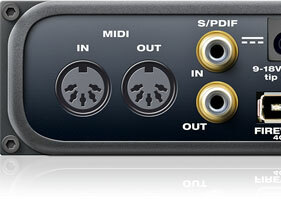 Add another Audio Express (or other MOTU audio interface) as your needs grow via a standard Firewire or USB 2.0 hub. The Audio Express provides driver-level support for resolving multiple interfaces with each other so that their audio streams never drift apart over time during recording or playback.